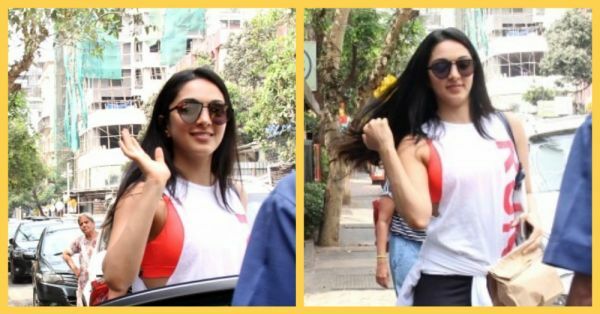 Kiara Advani was recently seen sporting a classic gym look that perfectly captures the summer vibe! In a casual knot tank top, black and white yoga pants and black sunnies, the actress looks oh-so-chic. However, it's not her matching silver slippers and big silver bag that stand out the most, it's the neon orange sports bra that we're crushing over! After Kareena Kapoor and Malaika Arora, it looks like Kiara Advani is all set to join the bandwagon of actresses with the perfect gym outfits. The sports bra peeking from under her basic white tank top has us scouting for the best neon sports bras out there! Pair this sports bra with a black or white tank top for the perfect workout look. Price: Rs 899, Decathlon. Add it to your wishlist! Twin with Kiara Advani in this popping neon orange sports bra. Price: Rs 3,999, Adidas. Add it to your wishlist! The actress was recently spotted in the song First Class from Kalank and will next be seen opposite Shahid Kapoor in the film, Kabir Singh. The actress has also begun shooting alongside Diljit Dosanjh, Akshay Kumar and Kareena Kapoor for Karan Johar's film, Good News.